The nursery Woody goes to shuts for 4 weeks a year, with a week at Easter being one of these. When I was working I would take this week off to spend together, however with this year being maternity leave it just slotted into another of our days home together. We went to my parents for Easter weekend and spent time going for walks, visiting stately manors and doing Easter egg hunts (over and over again!!). Woody loves a picnic, so we went for one whilst visiting the English Heritage site Witley Court. I hadn’t realised that a lot (from what I can see) of the English Heritage sites are ruins and so there is a lot of outdoor space for toddler running and exploring. This went down really well with Woody as he loves running about. We were at one point sat up a slight hill admiring the old house and waiting for the fountains to come on, Woody decided to take off running down the hill and didn’t stop when we called him. Rob ended up sprinting after him to catch him before he ended up in the fountain!! Lots of giggles followed for being chased!!! 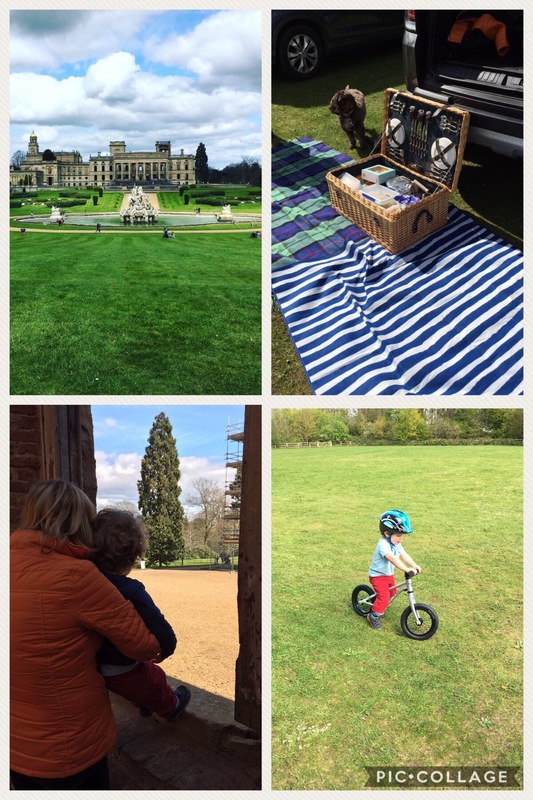 We were pleasantly surprised at how much we enjoyed our visit to Witley Court, and I would definitely recommend it if you are in the Worcester area. I’ve been on the English Heritage website trying to decide which site to visit next and it looks like a lot of the ones closer to us in Hampshire are free which is a bonus!!! Tuesday was the first day of the holidays noticeable for not being at nursery. Arlo was booked in to have his 8 week check up and the first lot of his immunisations, so we did that after a lazy pyjama morning. Such a sad cry when they have those jabs, but is all worth it to keep them healthy. 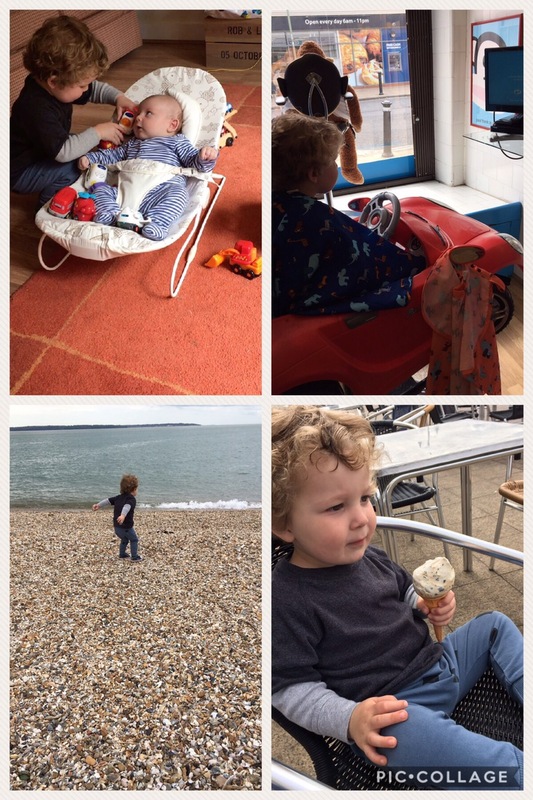 Then in the afternoon we took a trip to the sea side for a walk and an ice cream!! Woody has got so good on his scooter so he zoomed off on that whilst I pushed Arlo. It’s probably also worth noting that this was the first day of my diet to loose the mum tum!! In hindsight starting my diet on the same week as the Easter holiday was a bit of a fail as the extra parenting felt like it deserved more chocolate, but I stuck with it!! Wednesday, after another lazy pyjama morning we went to Petersfield Lake with my Mother-in-law and nephew for a picnic, a play at the park and a walk (there was definitely a theme for getting out for walks this week!!). Woody really enjoyed seeing his cousin and playing in the park with him, which was nice. And again the scooter came out for the walk around the lake. I had never been here before, but it was a great family friendly spot. Quite busy this time due to the school holidays, but one to visit again. I’m not sure how long the walk around the Lake was but it seemed just manageable for Woody on his scooter. It was a lovely sunny day too which always helps a picnic! Still need to get the boys new sun hats though- Arlo’s muslin hat will not be practical every time the sun comes out!! Thursday we were lucky to have Rob home from work. He had an appointment and then we headed out after that. 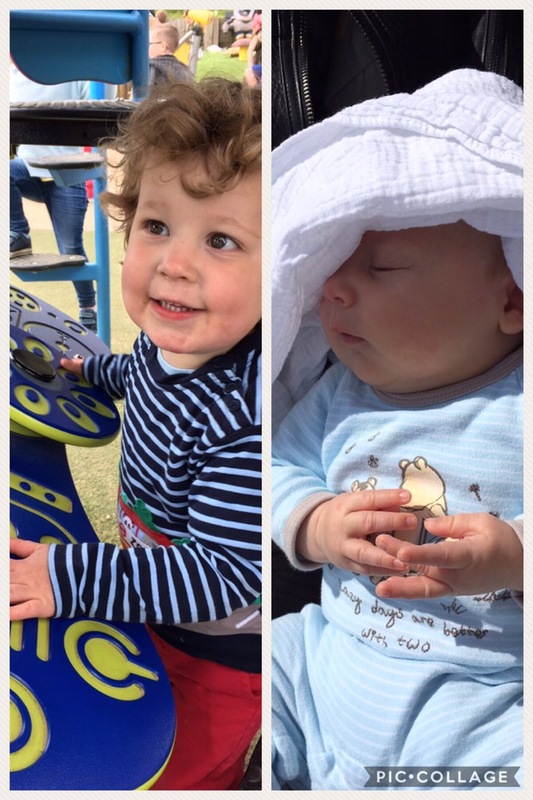 A trip to Costco this time – walking around all the different food sampling pods is any toddlers dream!!! I love a trip to Costco, pushing the big trolley down the aisles and trying to decide what bulk items we need!! I get a lot of bottled water here as I am going through it when I’m breastfeeding. We were going to go for a walk but it got a bit chilly and we weren’t prepared whilst out so home it was. 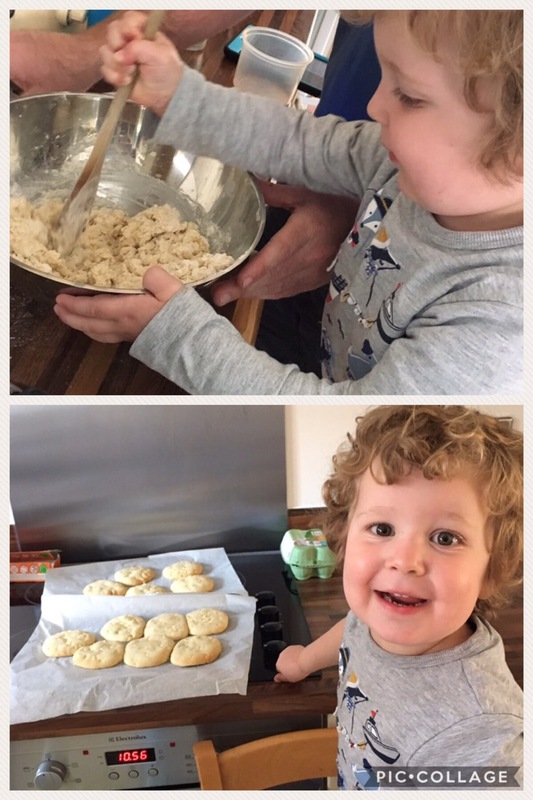 Once home Rob decided to do some baking with Woody which was fun (and tasty!!!). Rob went back to work Friday, so Woody, Arlo and I went for another walk!! I wear a Fitbit and never manage to get anywhere close to the recommended 10k steps a day! When I was working I’d manage 2-3k a day, and at the moment somewhere between 4K and 7k, so I wanted to see if I could make the 10k! 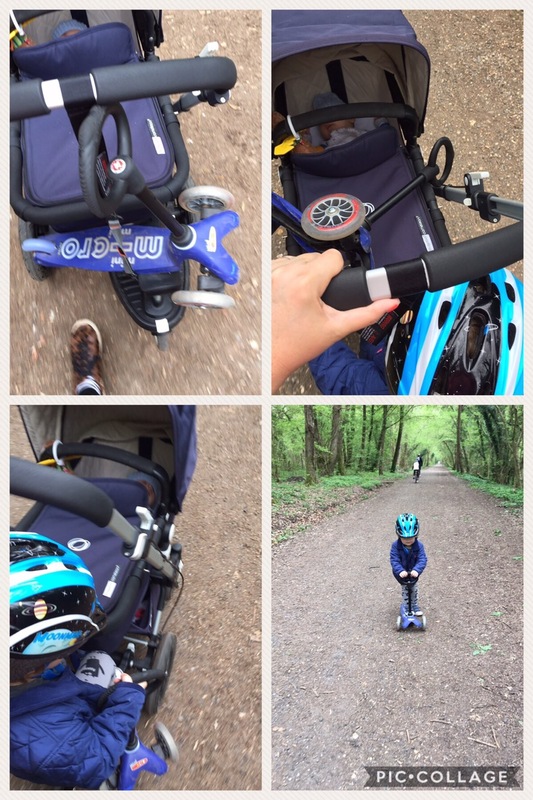 We walked for just over an hour – some of this at toddler pace and some of this at crazy woman pushing a pram with a toddler attached to it pace!! By the end of the day I had managed 10.5k steps which I was chuffed with! The scooter came with us on this walk but the path was quite bumpy so was slow going and had to be carried a bit- as you can see from the pictures we had lots of different scooter positions!!! Once in the car and on the way back home Woody asked if we could go to the park- hindsight now is screaming at me to say no, it’s 12’o’clock and you two need your lunch, but hindsight a great thing isn’t it!!! I said of course, lets go to the park. I did warn that once I said it was time to leave we would need to go, which he agreed to (again hindsight- he would have agreed to anything just to get to the park). We had been at the park about 20mins when Arlo started whimpering. I had him in the front pack carrier as I thought it would be easier than the pram. Woody refused to leave! I decided rather than make a massive fuss I will sit on a bench and give Arlo a quick feed and we can leave after that- save Arlo crying the whole way home. However, when asking Woody to leave once I was finished, he still refused. I managed to get him out of the park but we still had to walk across a playing field to get to the car. Woody proceeded to have the biggest tantrum whilst lying face down on the ground. I could not reason with him. I ended up getting flustered and cross at him which probably didn’t help, but had to pick him up under my arm and carry him across the field. I have not got small boys- they weigh a lot!!! So with Arlo in the Carrier and Woody under my arm I got to the car park. There was an older couple parked in a car next to mine with their windows open, I gave them one of those ‘oh kids’ looks (trying to hide my embarrassment)- they gave me a lovely judgemental look in return!! I got Woody into his car seat still kicking and screaming, Arlo into his and me into mine and we quickly made our exit. Tears all round at what had just happened!! I was becoming so confident at taking both boys out together and feeling I could control them and this hit my confidence. He calmed down once home and fed and I did get us out a bit later for a kick of the ball, but he managed another mammoth tantrum with Rob about bathtime, so we were both glad once the day was over! I know that toddler tantrums happen and at times there isn’t much I can do to stop them but I have reflected and taken some learnings from this episode! Stick two fingers up at judgemental looks- I don’t need to feel like I’m doing a bad job when I know deep down that I’m not! We had a nice quiet Saturday to get over Fridays events which was really nice! 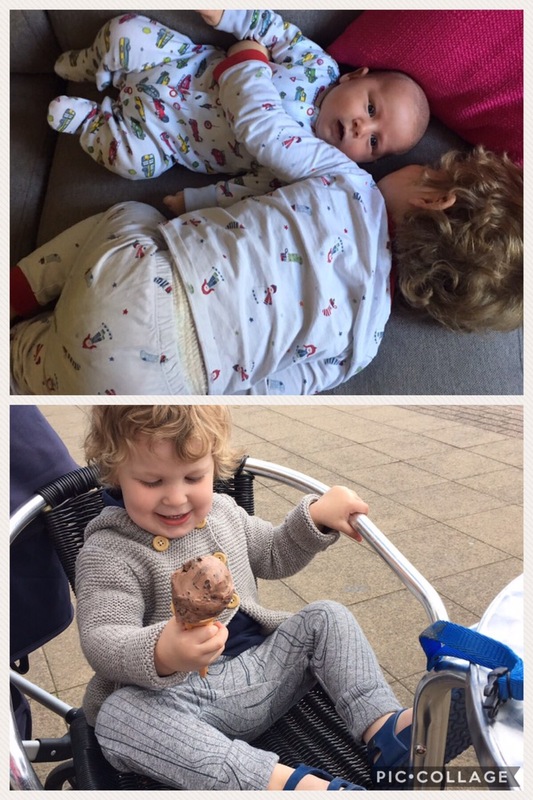 Naps, films and taking Woody out on his balance bike which he is slowly growing into! Monday was then a normal Monday before nursery on Tuesday! We went and got Woody’a hair cut at this fab place where they sit in cars and watch Peppa Pig. He was so good we went for an ice cream afterwards and dared a trip to a park next to the sea where he left perfectly when asked!! And then a quiet afternoon doing some more baking! Posted in Family. Tagged big brother, brothers, Easter holidays, english heritage, Family, little brother, Maternity Leave, mum of boys, mum of two, playpark, tantrum, toddler fun, toddler tantrums, toddler time, walks, witley court.